24 | February | 2010 | Through the seasons before us..
A trip to the Walkers Stadium presents a big test for Forest’s ailing away form – but, of course, also presents the perfect opportunity for us to get back on track with a morale-boosting win against a resurgent Leicester side. The Foxes are unbeaten in seven games having had a bit of a wobble in January, which coincided with a glut of away games. They’ve not lost at home since the start of December when Bristol City were their visitors. Back in December the fervour the Leicester fans usually bring to this fixture was somewhat reciprocated as at the time we sat in third and fourth in the table, and the winner of the game (us, as it turned out) would claim that third spot for their own. The fact that Forest were able to win so emphatically at the City Ground will provide players and fans alike with all the more reason to want to beat Forest on their own turf. The Reds don’t have any fresh injury concerns, and Billy will undoubtedly have given much more thought than I have to how best to line up against Nigel Pearson’s side. After a couple of disappointing results away from the City Ground I’m half expecting a cautious line-up in a 4-5-1 shape – it seems unlikely at this juncture that any loan signings might come in to freshen things up, which means Davies may be tempted to chuck in some of the fringe players to keep his squad fresh. Leicester are without dangerous frontman Matty Fryatt, and talented manager Nigel Pearson has refused to write off automatic promotion – although diplomatically and sensibly setting their stall out to stay in the playoffs. The Foxes are currently fifth in the league, having overcome Doncaster at the Keepmoat Stadium in midweek which puts them ten points behind us (with a game in hand), looking the league table gives the frightening prospect of an East Midlands/Wales playoff tournament! On researching their last game I found more stories about the forthcoming match about us on the official Leicester City site than I did about the match just played – which tells it’s own story! Once I found it though, it suggested it was an early strike and a bit of a siege job – in tricky conditions, with Doncaster enjoying greater possession and more chances. Mind you, we too had a tricky visit to Donny recently! All in all, a tough one to call – there was no way on Earth I was going to call our scoreline against them earlier in the season. At this stage of the season unpredictability really kicks in – our hosts certainly have more consistency of late with a decent unbeaten run – but then in their last three games they’ve only scored one goal. Four games ago they smashed five past Scunthorpe. I’m going to take the recent reslts though and predict a low-scoring result, probably a draw. It would be a massive three points if we could get the win though, as West Brom are likely to get a win over Derby at The Hawthorns. Of course, it would also be a massive three points for our hosts too as they bid to cement their place in the playoff places and potentially push toward the top two as they did earlier in the season. There’s a lot at stake, which is why I predict a rubbish match! 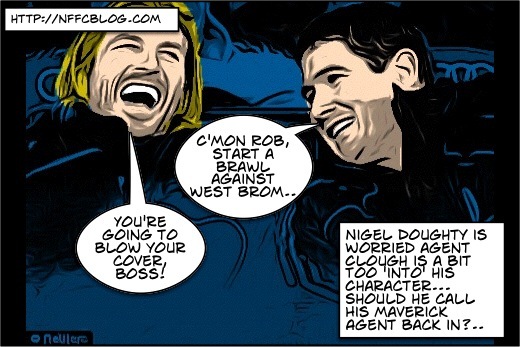 Doughty to abandon Agent Clough in the field?.. Worrying times for Nigel Doughty, as his lead agent Nigel ‘non-League’ Clough appears to be getting a little too into his role as the would-be manager of Derby County. His mission is to replace Derby’s squad with over-rated lower league and non-league playing staff whilst delivering a disappointing league finish. There had been concerns that the agent-lead initiative to drive a series of off-the-field infractions to damage Derby County’s standing with the Football League was welcomed initially by the Forest chairman. But the latest charge met by the band of thugs that Clough has assembled leaves Doughty concerned that the mission might well be compromised – as his agent’s efforts become more and more transparent to the onlooker. His options are to leave his field agent to operate ‘rogue’ without further support or guidance, or to recall him from the front line. Advisors are thought to have suggested that he sever all contact with Agent Clough who appears to have become so engrossed in his role as Derby County’s manager that he can no longer separate his mission from reality.